Athletes at all levels have a habit of playing through injuries, specifically concussions, in the heat of the moment, but the problem might be more prevalent among girls than boys, a new study indicates. Researchers looked at 87 youth soccer players, two-thirds of whom were girls, who sustained concussions during play and were later treated at a sports medicine clinic. More than half of the girls treated had returned to play the same day as the concussion, while only 17 percent of concussed boys did the same. Taken at face value, that indicates that girls are five times more likely to play through concussions than boys. 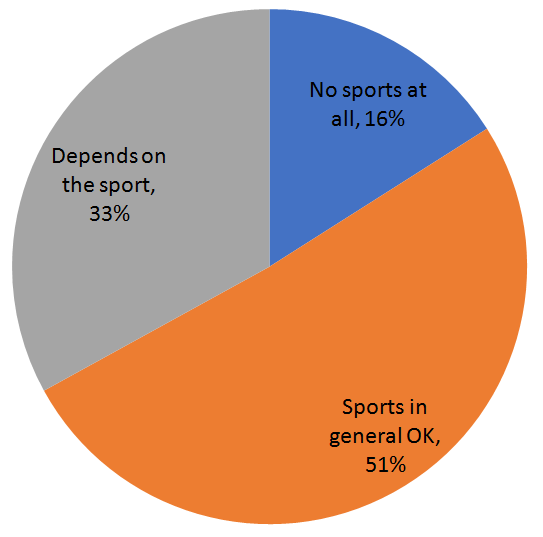 Of course, this study was limited to one sport, in one geographical area, with less than 100 participants, so its conclusions are preliminary. It’s safe to conclude, however, that there is some disparity. Girls are more susceptible to concussions than boys, but the study seems to indicate that they have less concussion awareness. If the phenomenon is borne out and confirmed on a larger scale, then more focus needs to be given to both educating girls about the consequences of concussions and regulating how they are handled in girls’ sports. Clearly the current efforts just aren’t enough. *Scientists have no conclusive evidence as to whether or how the reduction of g-forces during impacts reduces the number or degree of concussions and head injuries. GelDefender products provide supplemental padding as well as cooling and comfort benefits when used with helmets and caps. Participants in activities in which head impacts can occur should always use tested and approved helmets for protection. However, no helmet or supplemental padding can protect the user from all serious head or neck injuries that can result from impacts. Posted in Uncategorized	by GelDefender. The football world was rocked last week when a study of 111 deceased NFL players’ brains revealed CTE in 110 of them. That means that more than 99% of the NFL players studied suffered a neurodegenerative disease characterized by memory loss, depression, aggressiveness, anger, suicidal behavior, and dementia. People are rightfully scared. The study covered more than just pro football players, though. CTE was diagnosed in 48 out of the 53 former college players evaluated and three out of the 14 high school players. Overall, 87.6% of the brains studied were diagnosed. The news, while sobering, is somewhat tempered by the methods used in selecting brains for the study. They weren’t random samples; all the brains belonged to players who had been exposed to repetitive head trauma. And some if not most of the relatives who submitted the brains presumably did so because they noticed symptoms while the players were living. Both those factors would tend to skew the odds toward CTE. It’s also important to remember that tremendous strides have been made in the last decade in concussion prevention, detection, and treatment. It’s possible that the same study conducted a few decades in the future on the brains of current NFL players would yield more promising results. But even with all the progress we’ve made, most NFL players, by the very nature of their job, are exposed to repeated head trauma, and that makes CTE a very real and frightening possibility for their futures. Women are more susceptible to concussions. It’s a documented, thoroughly researched fact. The reasons that this is true are a bit murky, but the information is widely accepted. Concussion symptoms manifest differently and take longer to heal in women as well. Which makes it all the more disturbing that the National Women’s Soccer League requires 45 headers over the course of three days as part of its return-to-play protocol. Here’s a breakdown of the system: Players take an ImPACT evaluation at the beginning of each season to establish a baseline. After a suspected concussion, they retake the test, and if they fail are taken out of play for about a week. Then they take the test again (and again if necessary) until they pass. Up until this point, the system seems reasonable. But after passing the test, players are required to head the ball fifteen times in one day from eight yards away – five forward, five on the left, and five on the right. The same procedure is repeated on the next two days, with the distances increasing each day. Considering the known dangers of second impact syndrome, this is an incredibly risky policy. It would be unsafe to subject even a healthy brain to that number of consecutive hits, but to one that’s very recently been concussed, it could be disastrous. 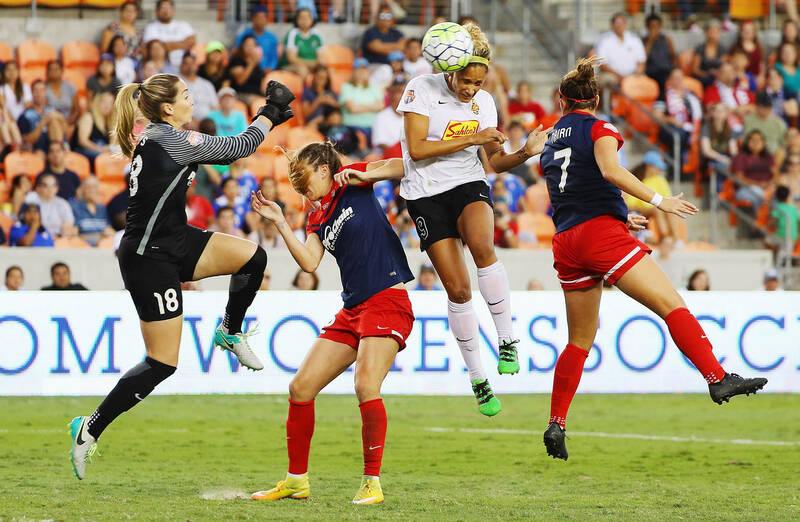 For the safety of its players, the National Women’s Soccer League needs to rework its concussion protocol to help players in their recovery, rather than risk further harm. With the constant release of new research that confirms the dangers of TBIs, it’s rare to get good news on the concussion front. 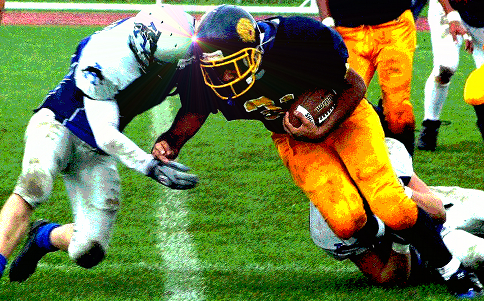 But two new studies may give hope to high school athletes who are suffering from the effects of a head injury. The studies, which followed up with high school concussion sufferers two years after the injuries, found no difference in quality of life and no higher risk of suicide when compared to high school students who have never been concussed. Of course, this does not negate the long-term severity of concussions, especially numerous concussions. While the news is encouraging, proper prevention, diagnosis, and treatment of concussions are no less important. But the studies do give hope to teenagers who are struggling through the symptoms of a head injury right now. There is a light at the end of the tunnel – it may take some time, but things will get better. And that’s something to celebrate. Prevention, diagnosis, treatment – the three primary areas we’re advancing in answer to the concussion problem. But that model of concussion research is not a triangle; it’s a timeline. If the first step in the process succeeds, then the second and third become unnecessary. Prevention is always the best outcome. That is the idea upon which former NFL offensive lineman Scott Peters has built his current career. He teaches football players to incorporate jiujitsu principles into their game, giving them more power when they hit and, more importantly, taking their heads out of the equation entirely. He realized the potential in the idea when, after his one season as the University of Washington football team’s strength and conditioning coach, his methods led to both the best rushing season in the school’s history and also absolutely no concussions in anyone on the roster. Now he trains teams on every level in Safe Football, his program for better and safer play using hands, not heads, to hit. Changing players’ style of play has been and will continue to be an uphill battle. In the past, players have felt as though they had to choose: protecting their heads or playing to their fullest abilities. And players who have been playing for years already have bad habits ingrained in them. A system that improves both head safety and effectiveness on the field could be a literal game-changer if coaches and players embrace it. Even if some have to relearn skills that have been ingrained in them for most of their lives, the benefits to be reaped are worth the work. Symptoms from a wartime TBI can be both long-lasting and shifting, new research suggests. It’s been well-established that concussions and other brain trauma have lingering and serious effects. But a new study discovered a change over time in the symptoms soldiers experience after head injuries from exposure to explosive devices. Cognitive symptoms seem to mostly resolve within the first five years, but psychological effects persist. The study monitored 94 service members who saw combat in Afghanistan (50 who had experienced concussive blast TBIs and 44 who had not) and assessed them one year and five years after the injury. The research team noted an “evolution rather than resolution of symptoms” between the two evaluations. By the five-year mark, the two groups in the study showed similar cognitive function (memory and thinking), but the TBI sufferers showed more signs of continued psychological damage than those without. Over 80 percent of those who had suffered TBIs sought treatment by mental health professionals between the evaluations, as opposed to only 40 percent from the other group. 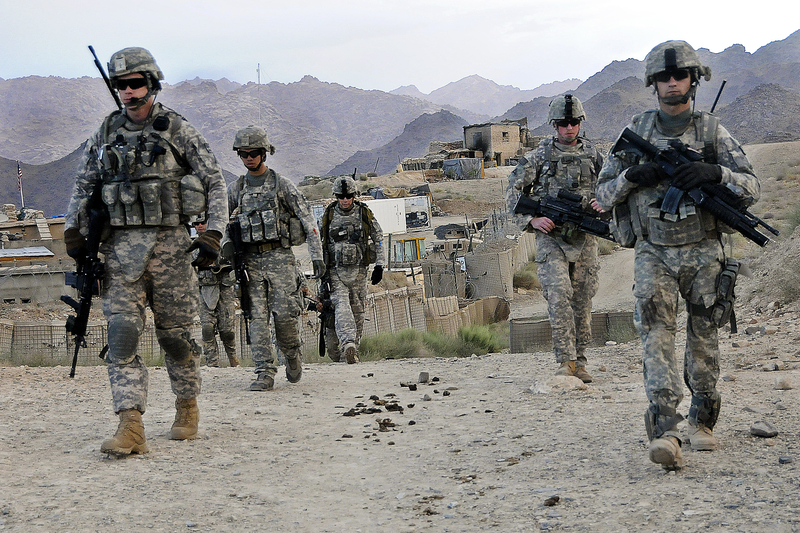 Preventing head injuries in our deployed troops could spare them years if not lifetimes of struggles and pain, and the need for safer heads in the line of duty has never been clearer. The difference a concussion makes is too great to ignore. Concussion awareness is higher in teenage athletes with access to athletic trainers, but those students aren’t more likely to self-report, a study has found. Over 700 teenage athletes from 14 schools in the Michigan answered 83 questions that revealed their knowledge of concussion issues and their own history with concussions. 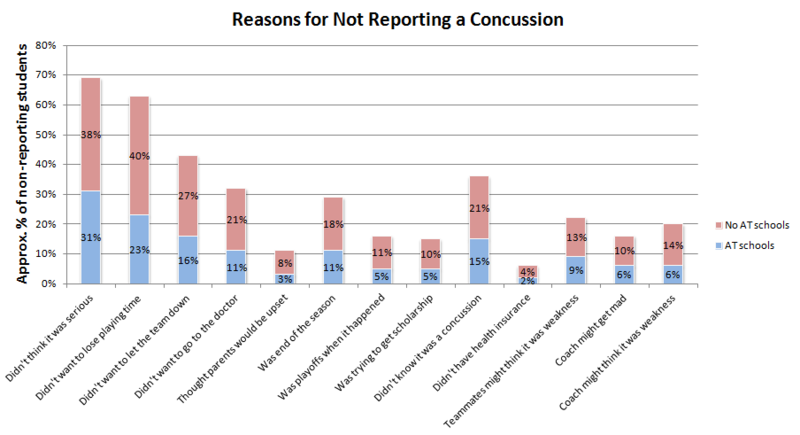 Those with access to athletic trainers better understood the dangers of concussions (94% vs. 87%) and the signs and symptoms of concussions (78% vs. 61%). In addition, fewer students with access to ATs thought they could continue playing if they believed they had a concussion or that they could continue playing with concussion symptoms. Athletes in general – and high schoolers in particular – have never been known to prioritize long-term safety and health over short-term pay-offs (if you didn’t already, see the chart above). If educating teens about the dangers and severity of head injuries is having little impact on them, then the parents, coaches, ATs and other officials need to be particularly vigilant. We can’t let teenagers with concussions fall through (or jump into) the cracks. Concussions have driven many away from allowing their children to play football in recent years, but a new survey of 1,000 parents says that trend may be spreading to other sports as well. In fact, some parents said they will not allow their children to play any sport at all. To the left is the breakdown of the responses. Of the parents that said that they’d only allow their children to play certain sports (about 330), basketball was the most popular, with 66 percent approving. Rugby was understandably the least accepted, with a 6 percent approval rate. Below are the approximate number of parents of those 330 or so who would allow their children to play each sport. Parents are learning to be cautious about sports concussions, and that’s a good thing. These numbers certainly reflect the growing concern over children’s heads and long-term health, though they may also herald a decline in the sports themselves. How big and how lasting of an impact remains to be seen, and only time will tell. The Australian Rugby Union has introduced an innovative device to prevent players from playing through concussions – the blue card. Red and yellow penalty cards are familiar, of course; they’re used by referees across a wide variety of sports to indicate a player has committed an infraction. Other colors as well have been used in various sports to signal different levels of unacceptable behavior. This blue card, though, isn’t used to indicate a breach of rules. Rather, it’s used to point out a player who, in the referee’s estimation, needs to be checked for a concussion. If a player is showing concussion symptoms, the referee can show him the blue card, and the player is automatically out for the rest of the match. He cannot play in any future matches until cleared by the union’s concussion protocol. The Australian Rugby Union is testing the blue cards, and if they’re successful, they could spread across rugby and then to other sports. This move gives the only impartial parties on the field the ability to take a concussed player out of the game. The referees have no dogs in the fight and nothing at stake (theoretically anyway). Instead of a team employee (player, coach or trainer) or a distant analyst making the call to remove a player, a neutral person who sees the injury and the player’s symptoms live and in-person can make the decision. And that could make all the difference. Teaching student football players how to block and tackle safely reduces head injury risk by a third, a new study says. Fourteen of the 24 high school football programs in the study had training from the Heads Up program, which covers hitting with shoulders instead of heads, correct helmet fitting, and general concussion awareness. Not only did those who utilized the program have one-third fewer concussions, but those who did sustain concussions also recovered and were able to return to play an average of 27 percent faster (11 days versus 15 days). This is a relatively small study in a limited geographical area, so more research is needed to establish just how effecting Heads Up truly is. But from the numbers, it’s safe to say that systematic, intentional head safety education is key in reducing concussions and aiding recovery. Whether it’s Heads Up or another similar program, football teams across the board should look at implementing a training system for their coaches and players to teach them how to play it safer.